ISO 9001 is changing. Due to be published in September of 2015 the new version of ISO 9001 will contain substantial changes. The whole structure is changing, there are rules imposed by Annex SL for common management systems, the results of surveys conducted by ISO are being addressed. We are currently at the DIS stage of the development of the standard. The Draft International Standard is subject to more substantial changes until the FDIS is published in early/mid 2015. But there are some things that are basically fixed including the majority of the structure, much of the content and the general sense of the rest of the content. What the changes will mean to you is debatable. ISO has indicated its aims for the standard but the certification and accreditation industry will have a huge influence over whether they will be successful. It may be possible for some organizations to do very little to maintain their certification. For others it may create an opportunity to increase and improve performance. Some choices still remain. This page is dedicated to discussing the issues, reviewing options and providing solutions to those already ISO certified and those thinking of certification. The goal will be to present information in different ways and to update it regularly . Quick answers to questions about ISO DIS 9001:2015, certification upgrade and transfer, professional auditor requalification requirements, and anything else you can think of. Q: When should our company implement ISO 9001:2015? Q: Why are changes necessary? Is ISO 9001:2015 worth it? Q: Why is a management representative no longer required in ISO 9001:2015? Q: Should I hire consultants to get ready for ISO 9001:2015? Q: How will my registrar convert certificate to the new ISO 9001:2015 standard? If you have specific questions about the ISO DIS 9001:2015 that aren’t answered here on this site, feel free to ask. Ask about how a requirement might be interpreted, what you need to do to implement it, what auditors are likely to demand, anything! Here we have a wide variety of articles and opinions about the new standard. This should be the start of your research. What is Organizational Knowledge in ISO 9001:2015? When to transition to ISO 9001:2015? This section contains articles, presentations and training that relates to a specific ISO DIS 9001:2015 Requirements. Where the requirements are greyed out, we don’t yet have content for those requirements but email us if you have specific questions and interests and we’ll directly respond and we’ll add content to that area. Note that general articles about a topic or overall discussion will be linked under the title. It is important to remember that most of the requirements that are not in section 8 derive from Annex SL. That means they are likely to be stable and will not change much in the ISO 9001:2015 standard. While it is possible that the ISO 9001 committees can change the content, they are under direction to not change the requirements if possible and only if they can justify a change. 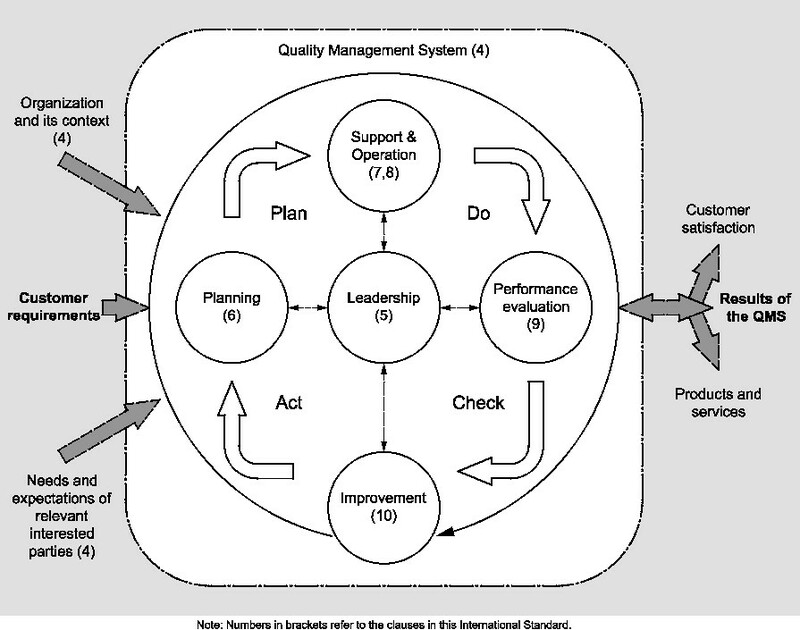 Further the structure of the ISO 9001:2015 is also unlikely to change. While it is possible that the ISO 9001 committees can change the structure of the standard, it is less likely that they will change the overall structure although the structure (as well as the content of section 8.) may change. AS 9100 is a non ISO standard that is based on ISO 9001 and managed by the IAQG (International Aerospace Quality Group) represented in the Americas but AAQG (Americas Aerospace Quality Group) and by similar groups in Asia and Europe. IAQG has had a team of about 50-60 experts working on the DIS 9001 standard since its issue. The group has concluded that while there are things about the standard they don’t completely support every change, there is nothing that they consider to be a “show stopper”. They have a formal project plan, stated objectives and a process that is set up to lead to a new version of AS9100 in April of 2016 (assuming everything goes smoothly – and it doesn’t always).